Do you brush your cat's teeth? Does the thought of doing that seem impossible? It's true that it can be tricky to brush a cat's teeth at home, but good dental care is crucial for long-term good health. 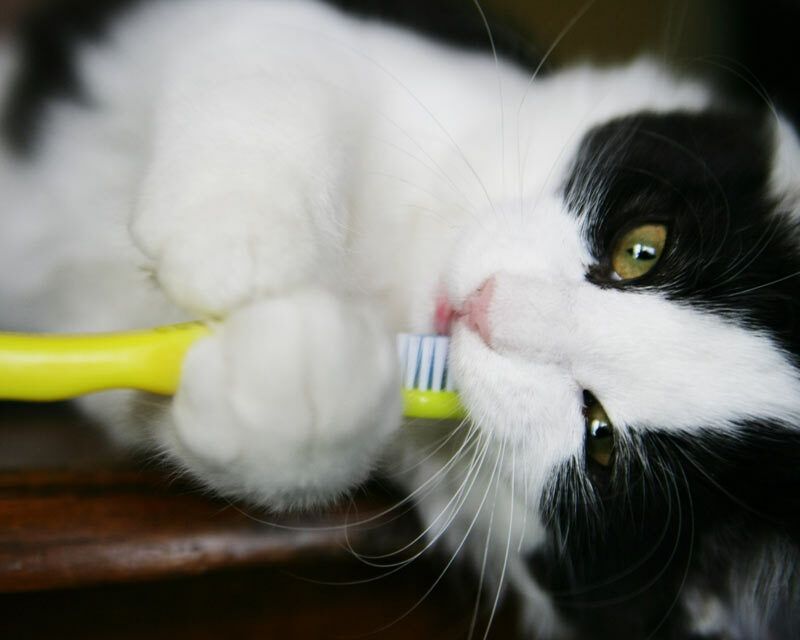 Why Is Dental Care Important for Cats? Plaque, a film containing bacteria, forms on the teeth daily, and it gets under the gum line, too. The plaque turns into hard tartar over time, and the bacteria multiply and wreak havoc not only in the cat's mouth but also in the rest of the body. What Type of Dental Care Do Cats Need? Tooth brushing is one of the primary ways to remove plaque before it becomes tartar and to keep the bacteria load in the mouth under control. Additionally, cats need routine professional cleanings done by a veterinarian. These cleanings are done under anesthesia with an ultrasonic scaler, to remove plaque and tartar from the teeth, including out from under the gum line. If you can find a helper, tooth brushing will be a bit easier. The helper can steady the cat for you and keep him from taking off. Get your supplies ready before you begin. You will need a small, soft toothbrush or a finger brush. If your cat is easy to work with, a finger brush can be easier because it's smaller and doesn't have a plastic handle that can knock against the cat's gums or lips, causing him to become upset. However, if you're not sure how your cat will react or you know he doesn't like his mouth touched, using a toothbrush is safer because your fingers will not be as close to the teeth. Don't use human toothpaste to brush your cat's teeth. The fluoride and sometimes some of the other ingredients, like xylitol, in them can be toxic to cats that swallow the paste. Instead, choose an enzymatic toothpaste labeled for pets. These will continue to help break down plaque on the teeth even after you're done brushing. If you've never brushed your cat's teeth before, sometimes it helps to put a little cat toothpaste on the finger brush and offer it to your cat to sniff and lick. It won't hurt him to swallow it, and if he discovers he likes the flavor, it will probably be easier to begin to brush his teeth. It's easiest is you stand to one side of your cat and lift his upper lip with your non-dominant hand, then gently rub the paste on using the toothbrush in your non-dominant hand. Always speak calmly and reassuringly when brushing your cat's teeth, and be gentle. Praise him when he's calm and lets you proceed. If you can only do a few teeth in the beginning, that's fine, just do those and try again the next day. Smear the toothpaste over all outer surfaces of the cat's teeth on the side you are on. If your cat is extremely compliant, you may be able to open his mouth and get the toothpaste on the inner surfaces, too. Move to the other side of your cat's mouth and repeat the process there. If you can brush your cat's teeth daily, that is ideal, but even if you do so every third day or so, the enzymatic toothpaste will be able to do some work on the teeth in the time between brushings. There are some newer treats that have been formulated to mechanically break open in such a way as to scrape the teeth off while being chewed by the cat. These can be useful in addition to brushing, or if you're unable to brush, they are at least a way to get some plaque off of the teeth. Ask your veterinarian about these treats. Be sure to plan routine visits to the veterinarian, and if the doctor doesn't say anything about your cat's teeth during or after the exam, ask about them. Find out when he or she thinks your cat next needs a professional dental cleaning.